Music: Petshop Boys - Go West! Saturday, October 31st, Day 28, somewhere in Western Uganda - We awoke before dawn. I woke to Alex tapping on the metal door to my little hotel room. A few minutes later the very sleepy and bleary-eyed proprietess was swinging open the squeaky metal gate to let our car out of the tiny courtyard, and we were on the road. At first it was pitch black and we had the familiar horror of chickens/goats/people/baboons crossing the road, but gradually the sky began to gloam greyly a bit, and I found us passing through valleys filled with fog, up over hills, only to plunge back down into the mist. The geography was much more hilly in this part of Uganda, and the majority of the cultivated land seemed to be bananas (which Ugandans eat in great abundance. And they have a different word they use for banana but, you know, my notes), there also seemed to be more forest reserves with their thick towering foliage. After a number of hours, by which time it was solid daylight, we found ourselves in an area of sprawling tea estates draped over the round hills. It kind of reminded me of napa valley actually, the well-kept tea plantations carefully trimmed in neat hedges of uniform height, dominated by a serene packing house in the middle, usually on the top of the hill. 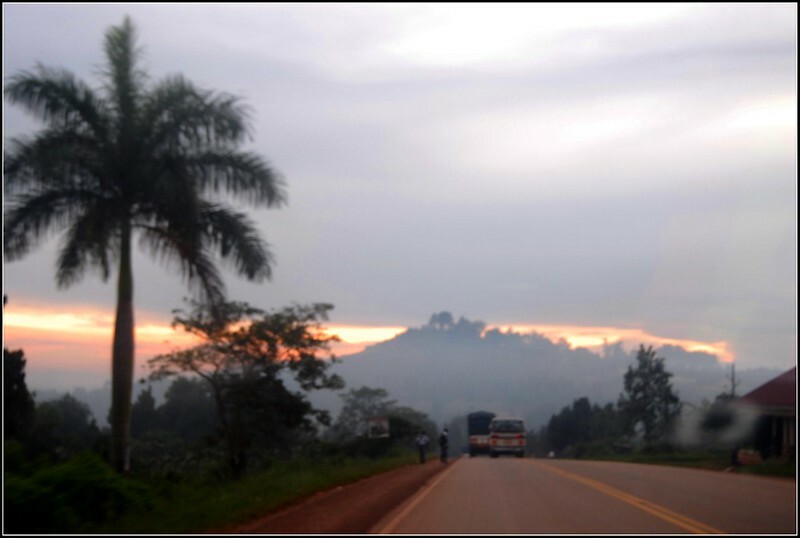 Just past the tea estates was the town of Fort Portal. I was imagining it was logically originally a fort at a mountain pass, a portal to the interior. It kind of is a portal to the west, but I haven't heard anything about a fort having ever been there, and it's named after a former colonial governor whose last name was Portal. Near the center of town, atop a hill, was the local King's palace (Uganda comprises about 8 kingdoms I believe), but we couldn't see much of it through the trees on the hill. I told Alex how I had almost met a king in Nigeria --he had allegedly been looking forward to meeting me, so I'm told, but he died the day before I arrived-- and Alex said he can arrange for me to meet one of them next year. That would be fun. I'd like to meet a king. It was nearly noon by now and we had never had breakfast, but Alex remembered a good restaurant from a previous time he'd been through there, and he successfully found it. It was called Dutchess, it's a hotel as well, it's run by a couple whom I can only assume are Dutch, and the food was absolutely superb. Well worth a stop if you're ever passing through Fort Portal. As it happens we passed through there about three more times and stopped to eat at Dutchess every time. Not only is the food delicious but there's a lovely outdoor patio with a nice view and birds chriping in trees. On this occasion I had banana pancakes I believe. The next time I was there I had crocodile skewers and honey glazed pork chops, and after this cautious step into the world of eating crocodile, I went full on and had the crocodile burger the next time. Crocodile it turns out tastes like a combination of chicken and shark and I think would be extremely good as a teriyaki burger (which this wasn't), and also left me thinking, man, there's crocodile farmers, that's one gnarly occupation! (I think I actually have a picture of the burger I uploaded to instagram, give me a little time I'll see if I can download it (hard to do from IG actually) and re-upload it (linking direct to IG the link breaks after a day). Feeling full and satisfied, we got gas and continued on our way into the true west. Another two or three hours we turned off the main road (two way, asphalt), onto a narrow dirt road just at the base of the Rwenzori Mountains, which towered up to our left. We rumbled down this road for 30-40 minutes, and came to a little village. Here we met with a bunch of people from the local co-op to talk about potentially doing a project with them, and then visited some local beehives in a banana grove. It began to rain whilst we were there and we returned down the dirt road under the refreshing showers. Back down the main road another hour or so and then turned off on another dirt road, this one would up and down and around the hills and up and up and up to a village high on the slopes of the base of the mountains. The view was spectacular. I took heaps of pictures, I'm sure there were some good ones on my phone.... but the splotch on the lense of the DSLR ruined most of the surviving pictures. As we arrived villagers were quickly scooping up the coffee beans which had been drying on mats, as the rain, which had abated, was looking like it was about to come on again. We met some people there, but mainly there was a lot of waiting for people to show up and sheltering from the rain, which began with a crack of thunder, echoing among the foothills. But we couldn't proceed to where the beehives were due to the soggy road, and the rain also prevented some of the important people from being able to come so it was resolved we'd have to come back another day, which I didn't regret at all. As I sat on a rudimentry bench in the (thatched) eaves of one of the houses, enjoying the fresh rain and spectacular view and the lovely company of the villagers (I just love villagers, they're so friendly, and quick to smile and laugh, and grateful for a visit, andeven come up with such beautiful clothes with so little, just beautiful people), I thought to myself, this is where I want to come next. 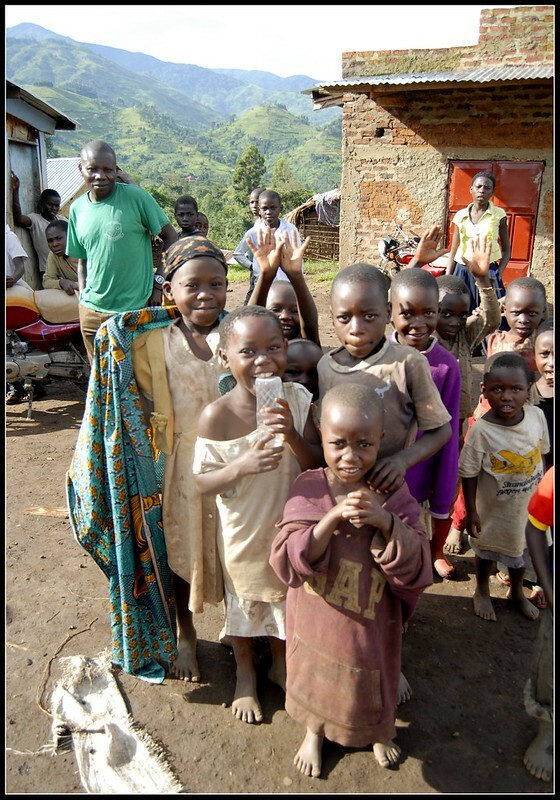 I want to do as many of the Uganda projects as I can, but it's more than I can do anyway so I'll have to bring in other beekeeping experts I know, but this village of the slopes of the mountains of the moon, this one is mine. They are always so grateful I've come to help, gushing their thanks, but really, sometimes I wonder, this is a gift, but who is helping who? I recently saw a quote: "travel is the only thing you can spend money on and actually be richer," or something like that, and this village in the mountains in the rain, this was one more priceless memory I'll have the rest of my life. One cynical young man said "are you coming back? because too often we hear there's going to be some project and we wait and we wait and it never happens," and I tried to stress that we were looking at various potential projects and I was in no way guaranteeing or promising that I'd be back, but I'm not sure anyone absorbed that, a man hears what he wants to hear and disregards the rest. From there we proceeded on further on down the road to Kasese where we'd spend the night. The road, which had been generally East-West took a 90 degree turn to the left here (it would otherwise proceed right into the mountains), and headed south into a broad valley, with the Rwenzori Mountains National Park on the West (and Congo beyond that), and Queen Elizabeth National Park on the East. At this point we actually did hit a chicken that was crossing the road. Why'd the chicken cross the road? We'll never know now. After two or three hours we arrived in the town of Kasese. Kasese is surrounded on three sides by national parks and so is kind of a safari/tourism center of the West. It's pretty nice as far as African towns go, it's main streets are broad, clean, and not too crowded, and the just-off-center streets are even more broad with buildings and houses set off a bit from the street. We pretty much drove into the center of town, rolled down the window and asked a bystander for a hotel recommendation, and thus ended up at the White House hotel just at the end of the main street, just off downtown. There we were checked in by Maggie and Sharon, two giggly 20-yr-old young ladies who are there as some sort of internship or work-study for a hospitality/tourism college based in Fort Portal. They were hilarious and I've really been meaning to call them to say hi. One thing that was particularly funny was Maggie's entry on the hotel registry: "Bill Payable By: Ransom." I guess my life was the safety deposit! Subject to liquidation for damaged assets! Anyway, there we got two rooms for around $5 a night each, and the rooms were pretty decent. Once again no attached bathroom / shower but hey for $5 I'm not complaining. Could have been big spenders and gone for the $10 rooms with attached bathrooms but hey we're not bougousie enough for that. Coming up! Healing hot springs! Surprise Massages! How I ended up with a Blue Taraco's tailfeathers! Boating on the Prince George Passage! Climbing the Mountains of the Moon! Going out on the town with Sharon and Maggie! And more!